Lt. 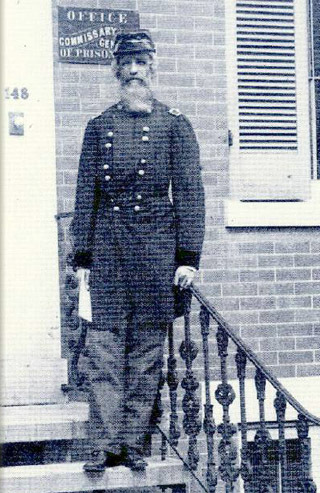 Colonel William Hoffman, 6th U.S. Infantry, led the military expedition against the Mojave Indians in the spring of 1859, resulting in the establishment of Fort Mojave. Lt. Colonel William Hoffman, at the head of a column of six companies of infantry, two of dragoons, and some artillery, struggled up the Colorado River from Fort Yuma. On April 23, 1859, Colonel Hoffman dictated a peace to the overawed Mojave chiefs, threatening annihilation to the tribe if they did not cease hostilities, make no opposition to the establishment of posts and roads through their country, and allow travel free from their harassment. Hoffman also took some of their leading men or family members hostage. Afterward he left for San Bernardino, taking most of his force with him; others went down river by steamboat or overland to Fort Tejon. Captain Armistead was left with two infantry companies and the column's artillery to garrison Hoffman's encampment at Beale's Crossing on the east bank of the Colorado River, Camp Colorado. Armistead renamed the post Fort Mojave. In late June 1859 the Mojave hostages escaped from Fort Yuma. Trouble broke out with the Mojave a few weeks later when they stole stock from a mail station that had been established two miles south of Fort Mojave, and attacked it. Mojaves tore up melons planted by the soldiers near the fort, and the soldiers shot a Mojave who was working in a garden. Eventually after a few weeks of aggressive patrolling and skirmishes, Armistead was able to fight the Mojave in a battle between about 50 soldiers and 200 Mojave, resulting in three soldiers wounded. Twenty-three Mojave bodies were found but more were killed and wounded and removed by the Mojave. Following this defeat, the Mojave made a peace, which they kept from then on. "The Native Americans of Joshua Tree National Park: An Ethnographic Overview and Assessment Study/" Cultural Systems Research, Inc., August 22, 2002, VII. Mojave.